This is my version of a really gorgeous and subtly flavoured autumn salad from the book Veg Every Day by Hugh Fearnley-Whittingstall. 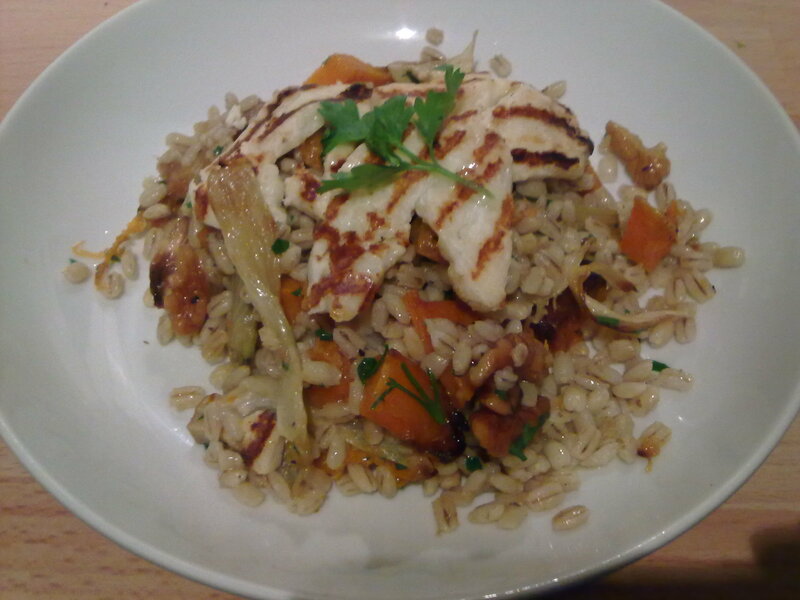 It contains pearl barley which is low GI and low in fat (and also good for thickening stews and soups or as an alternative to rice in a risotto), as well as roast squash, fennel, walnuts, parsley and grilled ‘lighter’ halloumi cheese. A beautiful, wholesome salad. Serves 4. Preheat the oven to 190C/gas mark 5. Put the squash in a roasting tin. Trickle over 2 tablespoons of the olive oil and season well with salt and pepper. Toss so that the squash is well coated and put into the oven to roast. Meanwhile, cut the fennel lengthways into 6 or 8 wedges. After 15 minutes, add the fennel and garlic to the roasting tin and turn with the squash and another tablespoon of olive oil. Roast for 20 minutes or so, until the vegetables are soft and starting to caramelise around the edges. Then scatter over the walnuts and cook for 8-10 minutes. By the end, the veg should be tender and caramelised, and the walnuts lightly toasted and fragrant. While the veg are roasting, cook barley in plenty of well-salted boiling water until tender, but still with just a bit of nutty bite, approx 30 minutes. Drain well and toss with the roasted veg, walnuts and any oil from the roasting tin, the rest of the olive oil, the lemon juice and the parsley. Grill or griddle strips of the halloumi until charred and place on top of the salad. Season with salt and pepper, and finally drizzle a little olive oil over the top, and a sprig of parsley if you want it to look extra pretty.